HomeBlog3D PrintingChapter 8 : There Is More To 3D Print Than Tanks!! 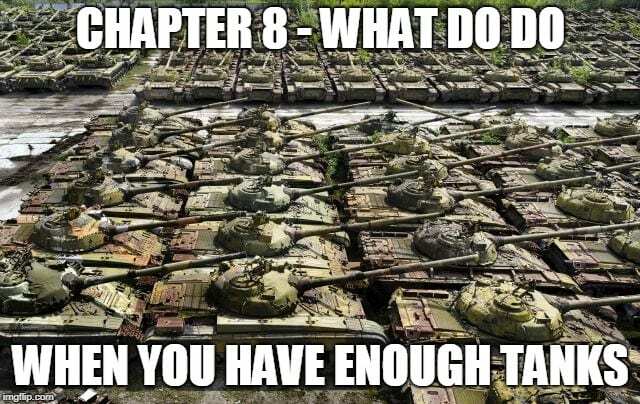 Chapter 8 – There is more to 3D Print than Tanks! You can do so much with your printer to improve your gaming experience. Every game table benefits from good looking terrain, and there are a lot of .stls available to help you print your own. Terrain makes the game table, and much like ambience in a restaurant can turn a delicious meal into either a memorable evening or one you would sooner forget, a well set up game table can really boost the players’ enjoyment. You can have the same meal (game), the same company (team mates), but where would you rather sit down to eat (play a game)? The table terrain can be the extra something that makes everything, even those bad dice rolls, more enjoyable. Why should I print my own terrain? Maybe you are handy and have already crafted some buildings out of foam board, poly foam, stir sticks, and other crafty bits, or perhaps you have purchased from the many suppliers of MDF wargaming terrain. Both have benefits and downsides. The home constructed stuff can be outstanding, but it takes time to get right, and it can be fragile. And fragile items in table top gaming don’t tend to have long life spans. The commercial MDF stuff is good, whether purchased unfinished or prefinished. But it can be fussy to assemble, and it is pricey. To do up a table properly can set you back the price of your first car. So if you have a 3D printer already, why not put it to use? For terrain you don’t need the same high-quality filament you would use to print your tanks… I say this hoping you do use decent quality PLA for vehicles and the like. For my terrain pieces I tend to go with straight PLA, still from a reputable supplier, but stuff that is less than half the price of the good PLA+/PLA Pro I use on my AFV models. Which is just as well, because it takes a LOT of filament to print some terrain pieces. So why would I want to do that? Because once you print it, you will have terrain pieces sturdy enough for the most ham-fisted members of your gaming group. They will be so durable you will be passing them on to your grandkids. They are that good. Your roads won’t curl, your buildings won’t warp, and you won’t have to worry as much when you store them. Roads – the beauty of the 3d printed roads is that they are flat, durable and light. This Bell Tent can fit many time periods; i actually designed it on request of a player of the game “congo” but it makes a good objective for Bolt Action. This is part of a simple, versatile road system available to download for free. the bridge and water sections are all 3d prints. Creating flexible waterways for gaming can be difficult, and this is one option you can consider. Gun Limber – which can tow ANY sized gun in Bolt Action, for 10 points as a regular. There are so many other files that you can find and use – railway tracks and rolling stock, factory machinery, the sky is the limit. Just be sure to adjust it to scale- often the scale isn’t listed in a posting, so you want to check and see what the finished dimensions are; you can do this in both your CAD and your Slicer program. Don’t forget that terrain designed for other genres and scales is equally usable in your game of choice – most buildings, roads, and other items can cross over from Medieval Times and a lot of the popular post apocalyptic game terrain works great for a devastated urban game table. Please read this before you load any of these files!!! If you try to print many of these larger files (houses, bridges, etc.) with the same printer settings as you use for your vehicles, guns and the like, you best get yourself a pillow and a good book. Because these files, although simple in design, require a lot of time to lay down. So you will want to set your slicer to a “coarse” setting – e.g. 0.3 mm layers ( defined as “coarse” in Cura) as opposed to 0.1 mm you will use for your AFV models. (this depends on the print, of course – don’t print the animals on coarse settings. They would be barely recognizable if you did). You don’t need the same attention to detail that you do on your tanks – no need for bolt or rivets to be visible, so you will lose nothing by “dumbing down” the print and you will cut print time by two thirds. It may still be hours, but if your printer is idle anyways, put it to work. It prefers to be productive. And leaving the machines idle allows them more time to plan for the inevitable machine uprising, so it only makes sense to keep them busy. Finishing these prints is quick and easy; I use a “rattle can” of grey primer, and then for buildings and the like, I don’t waste my good model paint; I just use regular crafting acrylic paint, an ink wash, some dry brushing, some static grass around the bases if appropriate, and a matt spray varnish. Give it a try, I think you’ll enjoy the results.